Aside from the cell shaded graphics, which were lovely then and still are now, the music was another standout. Old favorites Hideki Naganuma, Richard Jacques and Deavid Soul returned along with newcomers like The Latch Brothers. Classic tunes from the original game returned with fresh and funky remixes, like Naganuma’s “Let Mom Sleep” remixed by Jacques and Guitar Vader’s “I Love Love You” remixed by Naganuma. New classics were introduced like Naganuma’s “Fly Like a Butterfly” and Jacques’ “What About the Future”. The game was and is a true delight, and even fifteen years on you will still encounter gamers who just recently discovered the game and love it just as much as those who played it on release (for three days straight in my case). 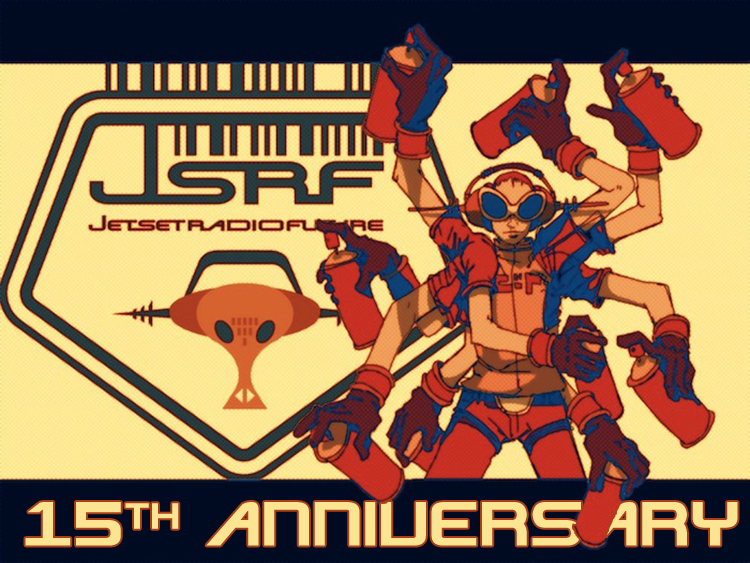 So let’s all raise our spray cans and toast Jet Set Radio Future on 15 years! I love JSRF! Definitely one of my favorite games of all time. I actually bought it about a week before I bought the Xbox. (Maybe I was waiting for my paycheck to be able to afford the console?) I remember spending a week just staring at the artwork on the box and in the manual and looking forward to playing it. I have both the Dreamcast and the Xbox versions, I remember preordering it so I could just pick it up when it came out on the 1st day. I played the xbox version for hours trying to get graffiti souls, the soundtrack is still worth listening to. I like the Dreamcast version but its a bit harder to get through. I wish this was released on DC like intended. It looks great and I’ve only played the original so I guess I need to pick it up! Barry how’s the backward compatibility on this? Because I sure as hell am not picking up the original X-Box. The one for Xbox is backwards compatible on the Xbox 360, I’ve been playing mine on it for years, if it works on mine it should for you. Yup, you can play it on the 360. There is some significant slowdown in some areas but it’s still playable. I did pick up an OG Xbox for this and a few other games that never got added to 360 BC. I’m still hoping that MS will surprise us with OG Xbox BC for the One someday. Really your JSRF is slow I’ve not experienced that and its multiplayer wow, I hope that they make another but more open and an easier way to grind at least with the buttons just trying to chain grinds to get graffiti souls. @Miguel, Yeah, IIRC on the 360 there was slowdown especially in the 99th Street area around the dragon. Thats the spot, it was difficult going around that dragon, yes chaining combos just for graffiti souls but fun exploring the hole game remember the massive sewage stage Wow. I don’t think it was ever intented for Dreamcast. All 2002 releases from Sega weren’t actually. Yes because they already made there minds up to make games for other systems. Most 2002 games were for Dreamcast. You can find previews for Shinobi, Virtua Fighter 4, JSRF and many more. This ain’t a debate. That is true actually. But I don’t think I say anything of Orta and JSRF being intented for Dreamcast. Neither was Super Monkey Ball 2. I wasn’t debating, but Unfortunately Sega chose to stop making games for Dreamcast whatever came out towards the end they either came out for Dreamcast in the states or the foreign Dreamcast systems, they wanted to put games on other systems. I read the dreamcast magazines at the time and also other companies talking about what might have come out on the dreamcast but didn’t, remember everybody wanting Panzer Dragoon Saga sequal or a classic Sega game that we wanted but ended up on other systems. On eBay the Sega GT combo comes for a nice price. The stand alone game is expensive. Wikipedia states the GT/JSRF Combo Sega GT runs at 16:9 where as JSRF runs at 4:3. Is it the same case for the standalone release? back in Spring 2002; I played JSR and JSRF back to back; it was Sega magic!